Knott’s Berry Farm is the birthplace of THE Boysenberry and each spring, Knott’s celebrates the flavorful berry and its historic roots during the Knott’s Boysenberry Festival with unique food and live entertainment. The 31 day food festival features over 75 one-of-a-kind boysenberry inspired dishes, drinks and more, plus foot-stompin’ entertainment, the Wine and Craft Brew Tasting Garden, and family fun everyone will love! From sun up to sun down, the festival offers good ol’ fashion food, fun and entertainment. 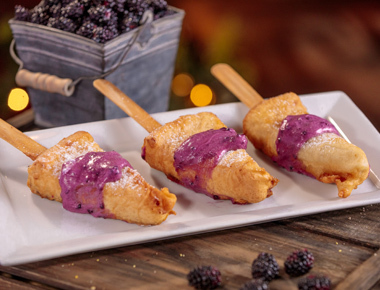 Pick up a tasting card to sample a few of the most popular boysenberry dishes in the park. For guests with a hankerin’ for some live entertainment, the options are endless with live music throughout the park. A berry good time is guaranteed! Located in Southern California’s Orange County, Knott’s Berry Farm is an iconic theme park with attractions and entertainment in themed areas inspired by the history and culture of the Golden State. Originally a working berry farm, every boysenberry in the world can trace its roots to Knott’s Berry Farm. As it evolved from roadside stand to world class theme park, beloved classic attractions like the Timber Mountain Log Ride and the Calico Mine Ride were added that still thrill today. With dozens of rides, shows and attractions in five themed areas, there is something for everyone at Knott’s. Splash down the Timber Mountain Log Ride, featuring new scenes, thrills, and special effects. The new Boardwalk area offers three rides for the whole family and Xcelerator, which launches riders 82 miles per hour in less than three seconds! Battle mysterious sea creatures in 4-D aboard Voyage to Iron Reef. Stroll the streets of the Old West Ghost Town® where you’ll meet its many residents – but look out for bandits! Camp Snoopy, home of the PEANUTS gang, will round out your day with pint-sized adventures in a high sierra setting. The new thrill ride Sol Spin is now open! Sol Spin sends brave guests on a thrilling adventure over 6 stories high as they rotate in all directions on one of six spinning arms. Each arm rotates 360 degrees independent of one another providing a different experience every ride. Plus... 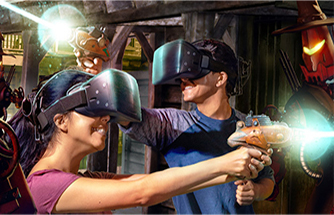 The new virtual reality experience VR Showdown In Ghost Town is now open at Knott's Berry Farm! This interactive attraction is the first permanent full motion virtual reality experience in a U.S. theme park. 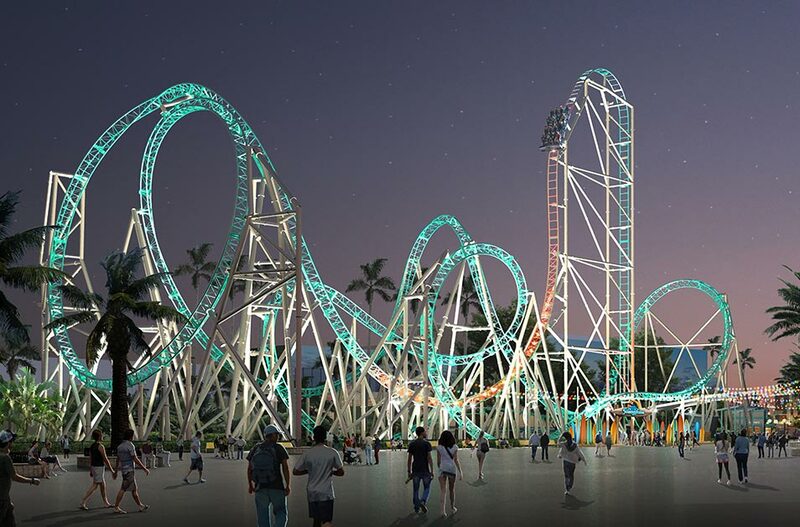 Now Open: HangTime - California's First and Only Dive Coaster! 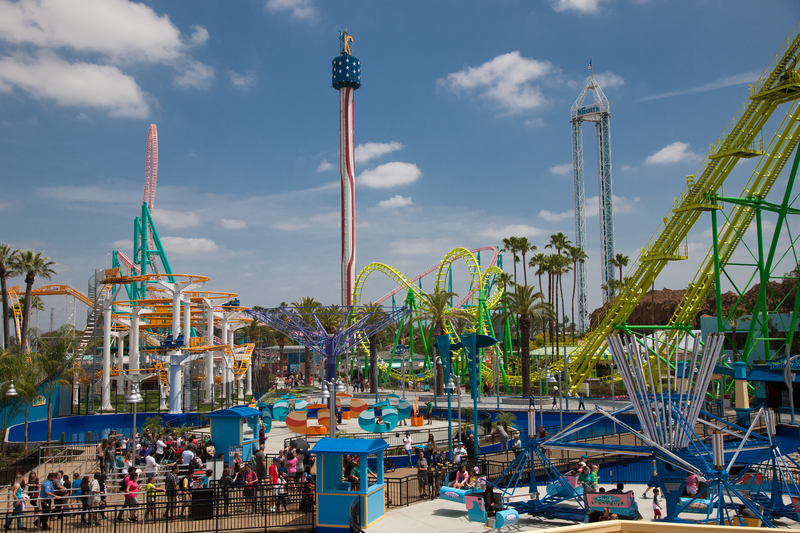 The newest addition to Knott's Berry Farm, HangTime, is sure to thrill! This looping coaster towers 150 feet above the boardwalk and showcases a "beyond vertical" drop! HangTime sends riders up a vertical lift hill into a 96-degree drop - the steepest in California. The coaster’s train then comes to a halt once the highest peak is reached, leaving riders suspended at the crest for several seconds at a 60-degree angle, giving the illusion of a disappearing track. Then the train suddenly descends through 2,189 feet of steel track and five gravity-defying inversions! HangTime is only the second rollercoaster in the Western Hemisphere to feature a negative-g stall loop which gives riders the sensation of floating. You don't want to miss this! Upgrade your Fun Express ticket to a Season Pass! Click here for more info. For Knott's Scary Farm tickets, click HERE. 1-Day Admission (3 years+). Valid any one day thru January 5, 2020. 1-Day Admission (3 years+). Valid Mon, Tues, Wed, or Thurs thru January 5, 2020. This ticket excludes all Fridays, Saturdays, and Sundays.